Over the past year, I have used a range of Google Apps to support my courses at Virginia Tech. While these Apps have transformed the way I approach the delivery of my courses, I believe there is room to further improve the Apps to help faculty/teachers create a flexible and integrated course platform. In this post, I list the Apps I currently use and provide my wish list of features that I’d like Google Apps developers to consider creating. 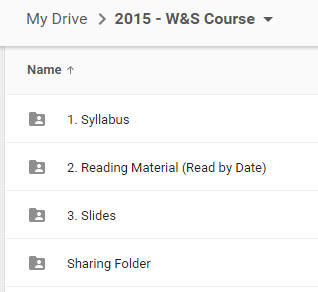 Google Drive: I share course-related material with students enrolled in my courses via Google Drive. Each course folder typically consists of Syllabus, Readings, Slides, and Sharing subfolders. The files saved in the first three subfolders are ‘read only’ to protect the integrity of the information/data. Students have full editing rights for the Sharing subfolder, which is where new material, Google Docs, Google Sheets, etc. are saved. Feature Request: I would like students who officially enroll in one of my courses to be ‘automatically’ added to the course folder on Google Drive. The development of this feature would require close collaboration with VT’s Computing and Technology-enhanced Learning and Online Strategies (TLOS) groups. Feature Request: I would like to have one interface where I could assign all the viewing/editing rights to each folder/subfolder for all of my students. This would save me from having to assign these permissions when viewing each folder/sub-folder. 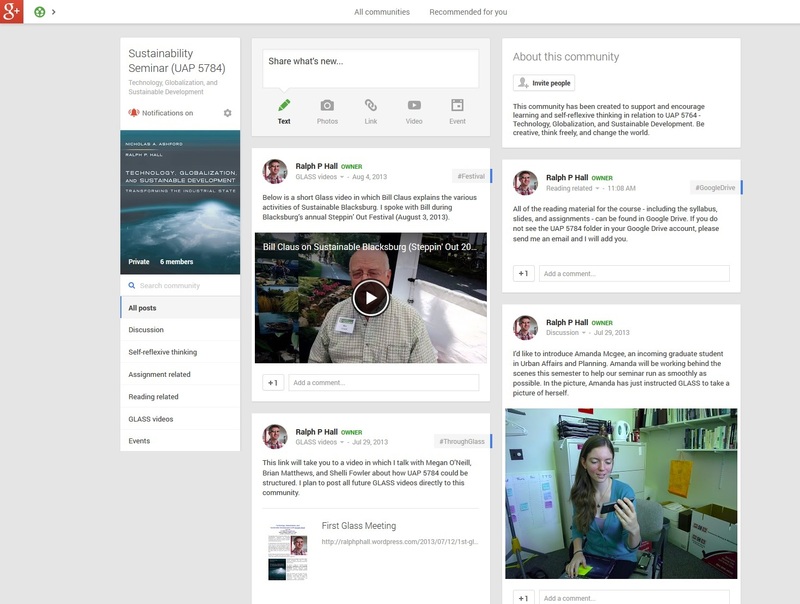 Google+ Community: I use both public and private Google+ Communities to share information and support course-related discussions/exchanges (both inside and outside of the classroom). The decision to make a community public or private is primarily based on the subject matter. However, I have found that private communities enable me to consolidate all of the Google Apps in use in one location, which is more difficult in a public setting since non-VT students frequently request access to course resources that are linked to a community. Feature Request: The Google+ Community is the epicenter of my courses. Right now I link other Apps – such as a Google Drive folder and Google Classroom – to each community by adding a URL link to the description of the community (see the image below). It would be useful if I could connect these Apps in a more explicit way – i.e., have a dedicated area/space near the top of the community where all related Apps can be more clearly shown. The same ‘connections’ area/space should be added to Google Drive, Google Classroom, etc. to enable a seamless transition between Apps. This feature grows in importance as the number of Apps being used to support a course increases. Google Classroom: Used as an assignment management tool. This App streamlines the sharing of files and enables me to privately send grades to the students. This App is also the most underdeveloped. Feature Request: I would like to be able to ‘add’ other instructors to a course that I have created in Google Classroom. When adding an instructor, I would like to be able to assign this person to all or a section of the students enrolled in the class. If an instructor is assigned to a section of the class, then this individual should only be able to view assignments (in the ‘Classroom’ folder in Google Drive) that are submitted by their students. The primary instructor should be able to view all of the assignments. Feature Request: As with the Google Drive course folder, all students who officially enroll in one of my courses should be ‘automatically’ enrolled in the class in Google Classroom. The self-enrollment feature should be maintained for students who would like to audit a class. Feature Request: As discussed above, there needs to be a ‘connections’ area/space in Google Classroom that enables faculty to link the App to all other Apps being used – especially to a Google Drive folder and Google+ Community. Google+ Circle: Used to share course-related announcements with students. Each announcement is sent to a student’s email and his/her private Google+ stream. Feature Request: I would like to be able to send announcements/messages to a Google+ Circle or Community directly from my VT email. This feature should mirror the dropdown sharing menu shown in Google+ and YouTube (see the image below). YouTube: Used to privately share assignment-feedback videos with students. The videos appear in each student’s Google+ stream. I currently record assignment-feedback videos using Snagit and upload these directly to YouTube, making sure all videos are set to private. Feature Request: Given the volume of feedback videos I manage for each course, it would be helpful if the ‘Video Manager’ icon had a much more prominent position in YouTube so it can be accessed from any page/view. Feature Request: When viewing the “Video Manager” screen (where all the videos are listed), it would be helpful see the name of the individual who was sent a private assignment-feedback video. Currently, the only way view these names is to “Edit” each video, which adds additional time to the process. Google Docs: Used during class sessions to co-create material and capture student responses to assigned tasks. Google Sheets: Used during class sessions to co-create spreadsheets and for homework assignments. Google Slides: Used to manage and develop lecture material. Feature Request: It would be useful if a Participoll add-on could be developed for Google Slides. While I have not yet used Google Groups, Google Forms, or Google Sites as part of a course, it would be useful if these Apps could be included in any ‘connections’ area/space that is developed. I would welcome the opportunity to speak with any Google Apps developers who are interested in working on any of the above features. Following the announcement that Google will no longer be selling Glass, I thought I’d provide an update on my plans for using Google Glass and Apps this coming semester. Essentially, not much will change. I will continue to use the platform to support my courses and plan to test new ways of interacting with students in the classroom, such as using ParticiPoll to ask questions during a presentation. My experience with learning and using Glass and Google Apps has transformed the way I approach my teaching. I no longer use VT’s Scholar system and run all of my courses using VT-supported Google Apps. I’m more willing to try new things and can easily walk away from ideas that simply didn’t work. I’m sure the spirit of the Explorer program had something to do with this. Below is the welcome message from Google that came with Glass device. During the Fall 2014 semester, I tested Google Classroom in one of my courses and will now rollout this App in all of my courses. I would describe the App as a useful assignment management tool that eliminates the need to download/upload assignments and streamlines this aspect of administering a course. While it took a while to understand exactly how files were being shared – this process is managed in the Classroom App – I’d recommend the App to anyone who is comfortable using Google Drive. Towards the end of this semester, I plan to conclude an assignment-feedback study I have been undertaking with Mary English that should reveal the value of providing video feedback in addition to written comments. With Glass being phased out for now, I plan to start testing alternative video recording devices and software to capture my feedback. The suite of Google Apps I use to support my courses will not change. I have included a short article below that was published in the Engineers’ Forum magazine (pp. 14-15) that talks about my use of Google Glass and Apps. The title of the article reflects my jump into the Google Inc. universe. A jump that I have yet to regret. The Journal of Interactive Technology and Pedagogy has just published a Tool Tips article I wrote on how I’m using Google Glass and Apps to support my teaching at Virginia Tech. The multimedia format of the journal offers a unique opportunity to embed pictures and videos in the article that provide a rich context to the platform I’m using and what students thought of the experience. This semester I’m going to use a Google+ community to support my course on Water Supply and Sanitation in Developing Countries. Whereas the community I created last semester for my sustainability seminar was private, this WASH (water, sanitation, and health) community will be open for anyone to join. My transition to using Google Apps is fueled by my interest in using Google Glass in education. While the VT Glass Team is still working on an App that I can use during my class (more to come on this), I have had some initial success in recording assignment-feedback videos for students. This semester I have teamed up with Mary English in VT’s Network Learning Initiatives, to formally evaluate my video feedback process. I am aware that there are many ways in which video feedback could be provided, but the Google Apps and Glass platform does make the process easy and therefore doable. I also believe that this use of Glass is one area where the device can add real value in an educational setting. Since the assignment-feedback videos are privately shared with each student (via their Google+ account), they will not be available on the Google+ WASH community. However, I plan to post videos that discuss new WASH material that will be of interest to my students. These videos will provide a sense of how the assignment-feedback videos work in practice. I will share the results from our formal evaluation of this application of Glass as soon as they are available. With the semester just over a week away, I wanted to describe the platform I plan to use this semester to support my seminar on technology, globalization, and sustainable development (UAP 5784). Whereas I normally use VT Scholar to manage all course-related activities, this semester I will use Google Apps to promote a more seamless exchange of ideas among the seminar participants. The other factor driving this change is I plan to use Google Glass to share important ideas/thoughts/insights with students that I have outside of the classroom. One dimension that makes this change possible is that Virginia Tech recently made the transition to Google Apps, which means that most students will be proficient with basic Google services such as Google Drive for sharing documents. The epicenter for the seminar will be a UAP 5784 community I have created in Google+. Since I wanted to create a space in which students would feel comfortable sharing their ideas, this community is private and only accessible to those taking the seminar. I have provided a screen shot of this community below, which shows a few posts I have made to the community. At this point, no students have been invited to join the community. This action will happen during the first seminar as we begin to explore the platform. As the semester proceeds, I hope this community will become a vibrant place where students can discuss and expand on the material we are covering. The seminar will have two distinct parts. The first will consist of a group discussion of the assigned reading material. Students will be asked to read and “work up” the reading material with comments and questions before each seminar and be ready to engage in a discussion of the core ideas and themes that emerge from the texts. In the second part of the seminar, we will take a more reflexive look at how the students engaged with the reading material. During this discussion, I plan to develop a conversation around the material being discussed in the on-line community. Before each seminar, students will be asked to prepare a short post to the community in which they can discuss anything of relevance to the seminar. The post could consist of written, visual (e.g., photos, artwork, etc. ), audio, and/or video media. Students could record a video (using a webcam) in which they describe their ideas and post it directly to the community for others to view. The process is simple so it will be interesting to see whether students prefer to write or record their posts. Each student will also be expected to comment on at least one post by a fellow seminarian. While student posts could document the questions they have about the reading material, I hope that the space will be used creatively. For example, students could discuss any additional material they consulted to better understand a specific subject. In addition, I will encourage students to try to document their key moments of learning in relation to the reading material, discussions, and/or assignments. 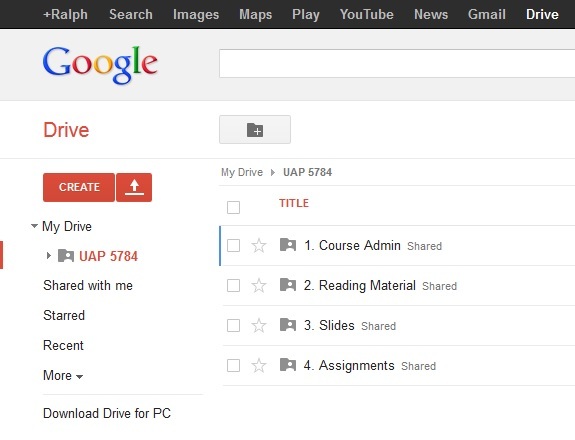 Since it is not possible to post files to a Google+ Community, I plan to utilize Google Drive to share documents and PowerPoint/Prezi presentations directly with students. Once each student has been added to the UAP 5784 folder in my Google Drive, they will be able to view all of the files saved in the folder. I currently have four sub-folders in the main folder labeled course admin, reading material, slides, and assignments. One nice aspect of the Google Drive set up is I no longer have to upload files to VT Scholar, which always proved to be a time-consuming process. In addition to using Google Drive to provide students with access to key documents, I plan to set up an individual folder for each student in the seminar. Students will be asked to save their assignments in these folders and provide me with rights to edit their documents. I plan to review, edit, and comment on each assignment on-line and record a video using Glass in which I will provide each student with feedback on their work while viewing it on my computer. I hope this more comprehensive feedback will demystify my written comments and provide students with a much better sense of how they could improve their work. This aspect of the seminar, which is made possible by Glass, is perhaps the most exciting part of this new platform. I’m keen to see how students react to this type of feedback and hope to see a discussion about whether it is valuable on the UAP 5784 Google+ Community. While I will create an email listserv for the seminar, I also plan to communicate with students using a Google Circle. At this moment in time, it is not possible to share a Glass video directly with a Google+ community. As a Glass Explorer, I was able to ask a “Glass Guide” (i.e., a member of the Glass development team) whether there was any way to do this. I received the following reply: “Currently you cannot share with a Community page, I’ll add this as a feature request.” Thus, this feature may be coming soon, but it’s not yet available. As a way around this problem, I can create a Google Circle that consists of all of the students in the seminar and post my Glass videos directly to this group. I may want to do this if I have an idea I would like to share and am away from my computer. I also received the following advice from the Glass Guide on how to share my UAP 5784 circle with the students so they won’t have to recreate the circle themselves. “It is possible to share a Circle with your class, so they’ll not have to create Circles themselves. You can do this by visiting Google Plus and from the ‘Home’ tab in the top left corner clicking on ‘People’. Then click ‘Your circles’ and select the circle you’d like to share. Click ‘Actions’ > ‘Share’ this circle and click ‘Share’. As the semester proceeds, I will provide the occasional update on how this “Google platform” is working and whether the students find this new approach to be of value.